The ML100 represents the leading edge of small form factor industrial computing, combining the Intel® Dawson Canyon motherboard with Kaby Lake processing and 4G LTE connectivity in our toughest NUC enclosure ever. 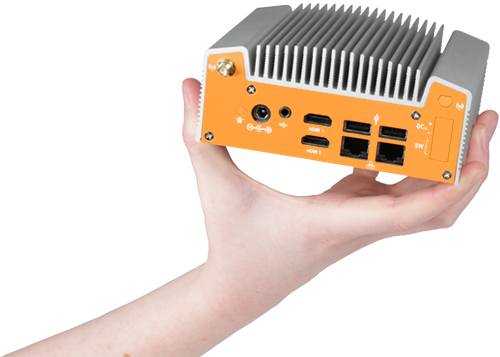 The ML100 Series blends high-performance IPC engineering with the Intel NUC form factor, resulting in a computer as versatile as it is compact. Long lifecycle components, high performance cooling, and a forward thinking approach to enclosure architecture make the ML100 the ideal innovation platform. Despite its diminutive size, the ML100 Series offers a full range of I/O connectivity, including USB 3.0, Gb LAN, and dual high definition video ports. With 4G LTE capability (coming soon), the heart of your application can stay connected without needing to rely on WiFi or wired Ethernet. Perfect for failover protection, on-site network independence, or remote applications. High performance cooling allows the ML100 series to dissipate heat more effectively and keep the system running when the going gets hot. Large vertical fins give the ML100 series a wider operating temperature range and optimal heat transfer. The ML100 Series protects electronics by directing electrostatic discharge through the case with the use of EMI shielding conductive foam gaskets. The ML100's nickel plated interior provides additional EMI protection. Protected by nickel plated steel and an aluminum extrusion, the ML100 Series brings aesthetic beauty to the industrial space. Defend against wear and tear, scratches and corrosion with the chassis’s durable textured paint and clear anodized finish.